“Perspective 96” is the last instalment of George Gilmour’s annual endowment to showcase young artists. For the exhibition, curator Jessica Bradley chose four painters: Cora Cluett, Eric Glavin, Angela Leach and Steven Shearer. Barring only Cluett, whose work is the most painterly, the remaining three are producing hard-edge. In her catalogue, Bradley makes connections to their work and the entrenched lexicon surrounding the genre: Minimalism, Pop, Op, Neo-Geo, and the thoroughly trampled simulation theories of Jean Baudrillard. The potential dilemma of wholesale paintings in this style is carrying the overwrought baggage of ensconced history. Bradley is right, you cannot disassociate their work from what preempts it — nor are these artists necessarily trying to. But there are differences between then and now. That all the artists’ works make reference to mechanicalism and digitalization suggests a perpetual motion of the genre which has proven to be particularly adept at continual mutation. In fact, in Toronto anyway, there seems a tangible resurgence of younger artists talking about the theoretical concerns of modernism over post-modernism. “Perspective 96” taps at this generational revisionism as though a kind of paradigm shift mixing in with a frantic end-of-millenia trajectory that keeps coming back to the vapidness and infinitism of technology. The inclusion of Cluett’s tactile work, which seems oddly and probably intentionally out of place, is her theoretic base: the insulating sociological aspects of computers, particularly with the Internet. 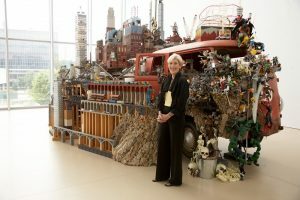 The repeated symbols she uses in her paintings spell out, in computer dingbats, kiss (: = *), and are stamped in grid repetition. Her colours are saturated opalescent reds, auburns and aged-whites applied like stucco, rich and tactile, and inches thick. Cluett suggests a polemic between medium and meaning, the human-like warmth of the work butting up against current social insulation and detachment through digitalization. But the result is a bizarre stalemate of either being too obvious or not convincing enough. Obvious in the sense that her references to technology don’t lead anywhere, or appear forced within the overriding context of this exhibition. Unconvincing in the sense that her tactile impressions far outweigh any conceived notion on digitarianism. But Cluett’s works do have a link, if only in a loose way, to the remaining artists’ works which are also defined by the presence of techno-vapidness, though ultimately they are working at defying it. In fact, to see Eric Glavin’s graphic, linear and cow painting in reproduction is simply ineffectual, even though it is mass reproduction to which his work refers. 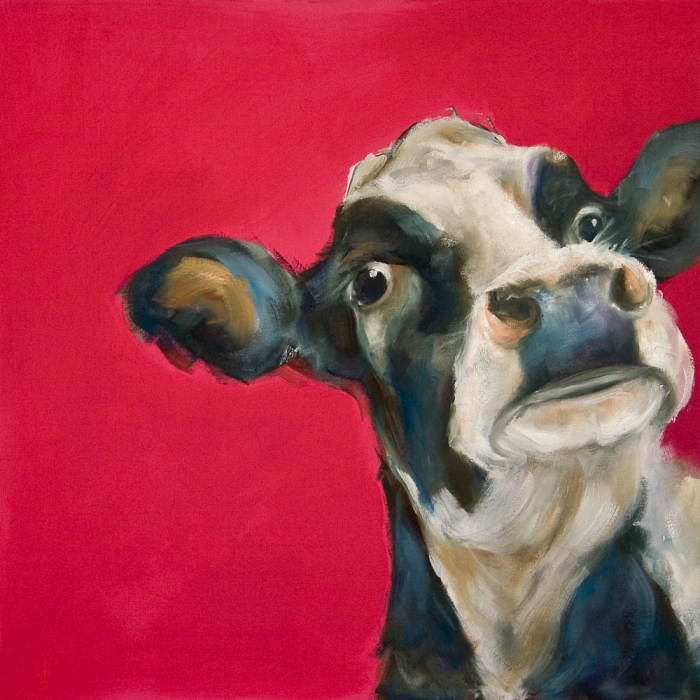 Hard-edged paintings like cow paintings are intentionally blemished — a slight variation within flat layers of colour, for instance — that are all important flaws defining his paintings as paintings; elements that scanners cannot pick up. Glavin’s subject matter, or lack thereof, is latent and so far removed from any origin that there is only an imprint of an undetermined memory. His choices of jarring, almost sick, colour combinations and heavily stylized forms hark back to indecipherable made-in-America fashion periods somewhere within the late 1950s right up to the 1990s obsession for retro. In a video shown during the exhibition, Glavin is talking in his studio and tacked to the distant wall is a Snickers wrapper. Oddly, that wrapper — which doesn’t appear to have succumb to any restylized up-dates — embodies the hyper-stylization found in his paintings. His kind of sophisticated populism goes beyond anything immediately retrievable, which is why the Snickers’ graphic seems so loaded as a tempting starting- or end-point. A similar pseudo-retro sensibility is found in Angela Leach’s work. Her paintings are small and long, like swaths of fabric. Six stripes of colour, repeated in some manner in all of peacock paintings on canvas, meander in patterns like Op Art interpreted through suburban basement decor and, somewhere in there, Jean Miro and his biomorphisms produced under the influence of self-induced starvation and sleep deprivation. (Those are my references, though Leach’s own mentioned sources are just as permeable and arbitrary: an African mask from her parent’s home, her collection of jazz albums from the seventies, a stackable set of stools she uses in her studio, and her adjunct profession as a weaver.) The paintings are beautiful, riveting things, and the six-coloured bands are pure psychedelia. But ultimately, her work is about the tedium of her stencilling and filling-in process that, like Glavin’s slight imperfections, cannot be created by any other means other than by hand. I would put Steven Shearer and Leach’s work together as the strongest match, in part because their processes to some degree define their work, though Shearer’s Untitled grid paintings that line up along the wall and have the look and feel of kitchen tiles, are completely produced outside of handcrafted production. He uses mathematical equations for signage machines to “paint” the work. Why Leach and Shearer connect is not in their methods — each being the extreme of the other — but the end product. Both are visually similar and equally rich, particularly with Shearer’s intricate grid works. In another stylized series, Shearer turned the bar code into a graphic pattern reproduced in duplicate and in insipid autochromes — one brown, the other orange. To give his colour range more description would suggest something “tasteful.” Shearer’s colours are intentionally anti-tasteful, like a 1970s rayon leisure suit in Miami. These works, and in particular TGIF, which feels completely familiar in its connection to optical graphics of 1950s and 60s, that a distinction from the previous era is hardly perceptible. The “Perspective 96” painters are serendipitous grazers; lifting, pilfering, appropriating from everywhere but without actually making a direct reference to origins — which is not too far from what the Internet does and is doing; of warping concepts of time and place within chronology, as well as dismantling any sense of property, ownership or originality. Which is different from the kind of appropriation used in the 1980s, with artists like David Salle or David Diao, who grafted from mass media iconography to skew the notion of high and low brow. None of the “Perspective 96” artists refer back to an identifiable icon and any nameable reference point is seamlessly omitted.